PORTSMOUTH STRIKER RONAN Curtis is a doubt for the upcoming Euro 2020 qualifiers with Gibraltar and Georgia having been forced to undergo plastic surgery after severing a part of his finger. The 22-year-old was leaving his home yesterday to join up with teammates ahead of a League One clash with Walsall when a gust of wind slammed the front door shut on one of his fingers. “Ronan trapped his finger in the door, it is quite serious and needed surgery to stitch it back on”, manager Kenny Jackett told Portsmouth.co.uk. “It happened at home. It was windy down in Portsmouth yesterday morning believe it or not and the wind caught the door as he was leaving his house to meet up with us. “According to his mum, the top of the finger was hanging off and they sewed it back on with plastic surgery. “It was 9am when I got the call, just when we were ready to leave, although he was okay by this afternoon. Curtis is one of eight strikers included in Mick McCarthy’s 38-man provisional squad for the upcoming games against Gibraltar and Georgia, with the squad due to be reduced to 23 players ahead of the FAI International Awards on Sunday night. The injury also makes Curtis a doubt for Portsmouth’s Checkatrade Trophy final against Sunderland at Wembley on 31 March. Email “Ronan Curtis a doubt for Euro qualifiers following freak finger injury ”. 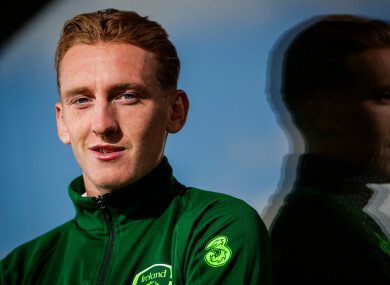 Feedback on “Ronan Curtis a doubt for Euro qualifiers following freak finger injury ”.